I am in total awe of this meditation. I knew I was onto something special in the first 120 days, where I swung from karmic hell in the first 40 days of Kirtan Kriya to sublime states of blissful consciousness in the following 80 days. So I stuck with it for another 120 days, And I’m still deeply in love. Not that this next phase of the journey has been easy. Oh no no no. Sure, it’s been without the sharp slap and sting of the first 40 days of Kirtan Kriya, but it has been quite confrontational in its own way… still with the sense of purifying, emptying, clearing karma and letting go of old stuff, which, less face it, can veer towards the very uncomfortable! There’s a kind of scrubbing clean that happens during those daily 31 minutes at dawn. Kirtan Kriya has slowly but surely levelled me down to ground zero in these eight months. It has taken away an awful lot of mental, emotional and, most notably physical noise which I hadn’t realised was there. Situations and people who used to be in my life just aren’t around anymore–not in a dramatic way, just in a sudden realisation, ‘Oh, I haven’t heard from x, and I’m no longer doing x’. 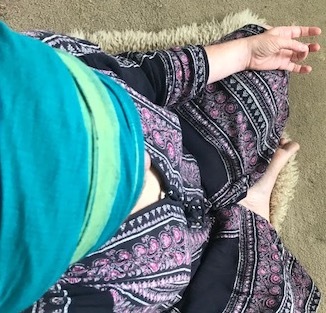 Those who follow this blog will know that, around 120 days into my Kirtan Kriya journey, I found my self a little bereft within a vast expanse of nothingness. Tumbleweeds. It felt like a real reset, and a strong sense that Kirtan Kriya had a lot to do with that reset. Life started happily filling up again, with new opportunities that do rip me out of my comfort zone somewhat, but in an exciting and healthy way (plus I’ve been practicing prosperity kriyas on 40-day runs since the start of the year). The main thing, though, is that these 240 days of Kirtan Kriya have built up a kind of forcefield around me that refuses entry to anything that doesn’t resonate completely, anything that’s not serving my highest self. I find only the really good stuff gets in, and I’ve learnt to trust it deeply. My friend Jen calls it the Kirtan Curtain. Sure, there are a lot of opportunities that present themselves that I think I want to happen, but when it comes to crunch time, if it doesn’t totally resonate with whatever destiny is driving me, it just doesn’t get through the Kirtan Curtain. And, on the flip side, whatever does come to fruition has, it goes without saying, been granted entry by the Kirtan Curtain – and it, so far, has all turned out to be pretty good. My tune hasn’t changed. I recommend Kirtan Kriya so highly. If anyone is on a similar journey, please do get in touch and let me know if you have a Kirtan Curtain too!